Bayou City Bolt carries a wide variety of Machine, Tapping and Wood Screws. We keep hex head, round head and pan head in stock. 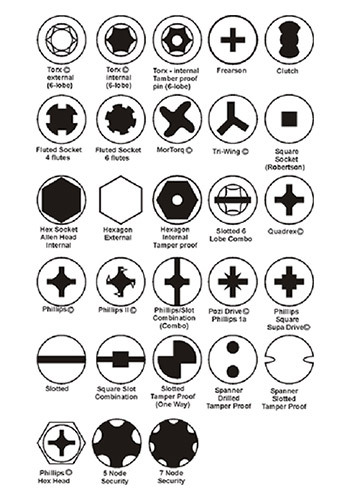 Drill point screws as well as construction fasteners are available as well. We also stock specialty screws such as Tamperproof, Thread-Cutters and Set Screws. The term Machine Screw typically refers to small diameter, general purpose screws. Machine Screw diameters range from #0 (1/64") up to #14 (1/4"). Machine screws are threaded to be used in a tapped hole, or with a nut to join two mating surfaces. Tapping Screws, also known as Sheet Metal Screws have the ability to "tap" their own internal thread when driven into metallic and non-metallic materials. These sharp threads cut into a material such as sheet metal, plastic or wood. By cutting their own thread, they create a good thread fit which increases resistance to loosening while in service. The shank is usually threaded up to the head. Wood Screws are formed in a similar manner to tapping screws. However, the thread length is approximately two-thirds the nominal length of the screw. The unthreaded portion of the shank is designed to slide through the top board (to prevent binding) so that it can be pulled tight to the board it is being attached to. Lag screws, also sometimes called lag bolts, are basically "large wood screws". A typical lag bolt can range in diameters from 1/4" to 1 1/4", and lengths from 1/4" to 6" or longer, with coarse threads similar to a wood-screw. The head is typically an external hex. Lag bolts are used to lag together lumber framing, to lag machinery feet to wood floors, and other heavy carpentry applications. Thread forming screws, or Thread Cutters, were designed to extend Tapping Screws to thicker and/or harder materials. Thread Cutters have cutting flutes or edges at their point so that the screw will act as a tap and cut its own mating threads.